Bake in preheated 400-degree oven 35 to 40 minutes, or until crust is golden brown. Cover edge of crust with strips of foil, if needed, to prevent overbrowning. 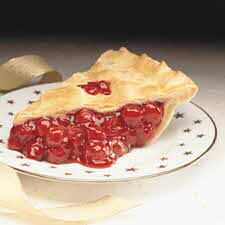 Note: If desired, 1 cup of dried cherries can be mixed with the cherry filling before baking for added cherry flavor. Nutrition Facts per serving: 269 cal., 2 g total fat (1 g sat. fat), 60 g carbo., 2 mg chol., 1 g pro., 1 g fiber, 69 mg sodium. Daily RDA values: 8% vit. A, 10% vit. C, 2% calcium, 2% iron. For more cherry recipes and tips, visit www.choosecherries.com.